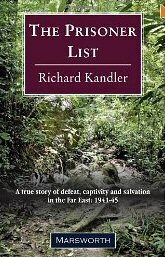 Richard Kandler has recently completed his book, "The Prisoner List", about his late father's FEPOW experiences. Reuben Kandler (referred to throughout the book simply as "Ben") was taken prisoner at Singapore, before being transferred to the Saigon docks and, later, the Burma Railway. After completion of the railway, Kandler began to compile the "prisoner list" of the book's title, which detailed the awful truth of what had happened to the thousand men in his contingent. Of the 700 who had transferred with him to Thailand, they had lost one in five in their first month on the railway; one in three never came home.As the war reached its final stages, Kandler had to go to increasingly extreme lengths to hide his record book from the prison guards and from the Kempetai. He was also hiding other items, including a cash box containing illicit local currency used for the benefit of the sick prisoners; he came dangerously close to being found out. The book has its own website at www.theprisonerlist.com, which is well worth visiting even if you decide against buying it - not least for the video clips of the interviews with the author's father on which the book is based. The book is published by Marsworth and can be ordered through the above website.